Helping patients gain a realistic expectation about their financial responsibility for visits, tests and procedures can help move toward the goal of increasing patient satisfaction scores while also driving toward lower A/R days and ultimately heightening the positive perception of a health system within a community. 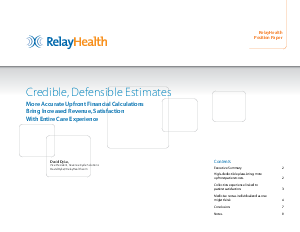 There are many variables involved in creating patient-specific estimates of responsibility, but the technology, tools and staff development models exist to accomplish this with a high degree of accuracy and compassion. This white paper explains why hospitals and health systems should concentrate efforts on determining a patient’s financial responsibility up front and outlines the gains that can be made by setting clear expectations for payment while preserving the positive perceptions of the care experience.